Last week we were blessed with another (albeit short) season of everybody’s new favourite makeover show. 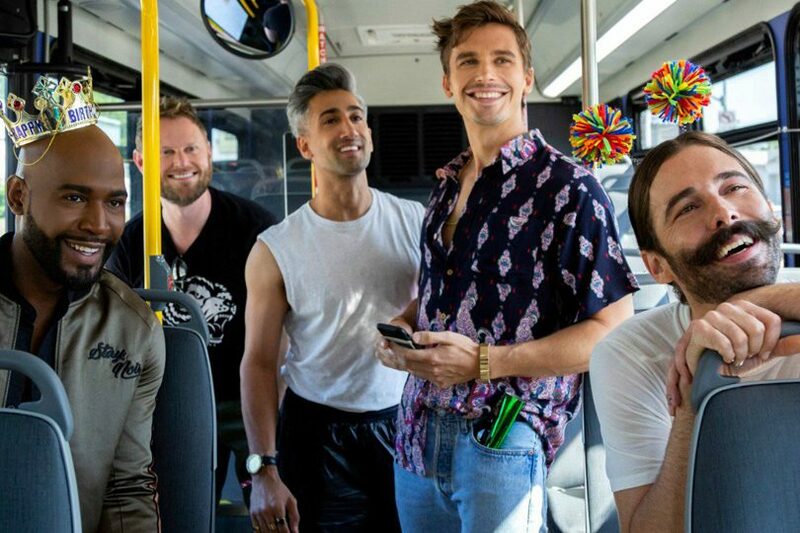 After a successful reboot last winter, the return of Queer Eye was upon us, and subsequently, my crushes on Antoni, Jonathan, Tan, Karamo, and Bobby have also returned. This time around, we got to see Antoni make more than just grapefruit salad, hot dogs, and avocado toast. We also go to see a little bit more of Bobby’s design process, which went famously unseen in previous seasons mostly because Bobby was busy re-designing a whole house in five days. Something I loved, that I also thought made this season of Queer Eye better than the previous two, was how willing, open, and excited all of the “heroes” were to receiving their makeovers. It made way for deeper discussions, and change, more than we had seen before. I watched the entire season over the course of a weekend, so I’ve compiled the most important, and useful style, and beauty advice so we can all get on the same page. (This is your official spoiler warning). Episode one introduced us to a prison guard, who lived a pretty self-sustaining life. Jody grew her own produce, and hunted for her own food. With her job, and lifestyle, she told the Fab 5 that she didn’t feel like a “lady”. Over the course of the week, she learned that wearing dresses and heels, and getting blowouts didn’t have to be her definition of femininity. She was already a strong, powerful, and beautiful woman, and only she could define the type of woman she wanted to be, as we all should. Jody also learned the importance of female friendship, and how much she could benefit from having other women to share experiences with. Unless you know what you’re doing,(and you still probably don’t) bleaching your own hair without the help of a professional can go very wrong, very fast. Trust me. JVN has always been outspoken on reading up on the ingredients in your hair and skin care products to make sure you’re putting only the best stuff on your face. This will prevent your hair/skin drying out from using cheaper products, and also from putting hand cream in your hair. Seriously, could hero Rob not just read the label? In episode three, Tan showed the fierce Jones BBQ sisters that they can still be comfortable in a denim/blouse combo, and that a garbage bag can absolutely not be used as a handbag. Tan also pulled some incredibly classic, and chic plus size looks together for the sisters, and I can’t thank him enough for it. A lot of the time plus size women/women in general, try to adhere to a made-up list of “fashion rules” for their bodies. Throw them out the window. Try new things, and wear whatever makes you feel good. And while we’re still on this point, yes, you can absolutely wear a horizontal stripe. Thanks for clearing that up Tanny. Have we learned nothing from Hannah Gadsby? Constantly picking on yourself is damaging your sense of self-worth, and I’m going to be honest, everyone around you is annoyed by it! Imagine watching someone you love with your whole heart constantly pick themselves apart and break themselves down. There is no time for hating on yourself. Instead, try channeling that energy into being kind to your self/body. Being self-deprecating doesn’t exist from now on. In this house, and on this website, we only practice self-love. Thank u, next. Episode five was my favourite of the season for a few reasons. The episode’s hero, Jessica described herself as a lesbian with a “lumberjack” style. When it came time to getting help with her wardrobe, Jessica abandoned what she thought she had to wear, and just wore what she liked and made her feel good. Sometimes it was a tailored suit, sometimes it was a leather dress and sneakers. When she no longer felt like she had to define her style, she became the style icon of the season. It’s 2019, getting dressed doesn’t have to have a direct connection with your gender, or sexuality. Just dress how you want. We all have celebrities/important people we look up to for style and fashion tips. But sometimes what works on them won’t work on you. That’s ok! Taking elements from a certain trend, and making them work for you/your body will keep you comfortable, and confident all day. Being confident is not easy for everyone, and it won’t happen overnight. Much like our fav Queer Eye guys, the best you can be is authentically you. Don’t hide who you are, embrace it, and let your beauty radiate through you. Stay gorgeous.